Uses IPsec VPN to securely connect your on premise network with Alibaba Cloud while maintaining a strong security posture mitigating the most advanced threats. Mitigate attacks targeting your VPC while gaining unprecedented visibility and control over your network traffic with Check Point's advanced threat prevention security. Simplify compliance and audits by consolidating logging and reporting across on-premise and cloud environments with Check Point SmartEvents. Check Point CloudGuard for Alibaba Cloud easily extends comprehensive threat prevention security to Alibaba's cloud, protecting assets in the cloud from attacks while enabling secure connectivity. CloudGuard lets you enforce consistent security policies across your entire organization by protecting data between the corporate network and the Alibaba Virtual Private Cloud. CloudGuard also inspects data entering and leaving the private subnet in the Alibaba VPC to prevent attacks and mitigate data loss or leakage. 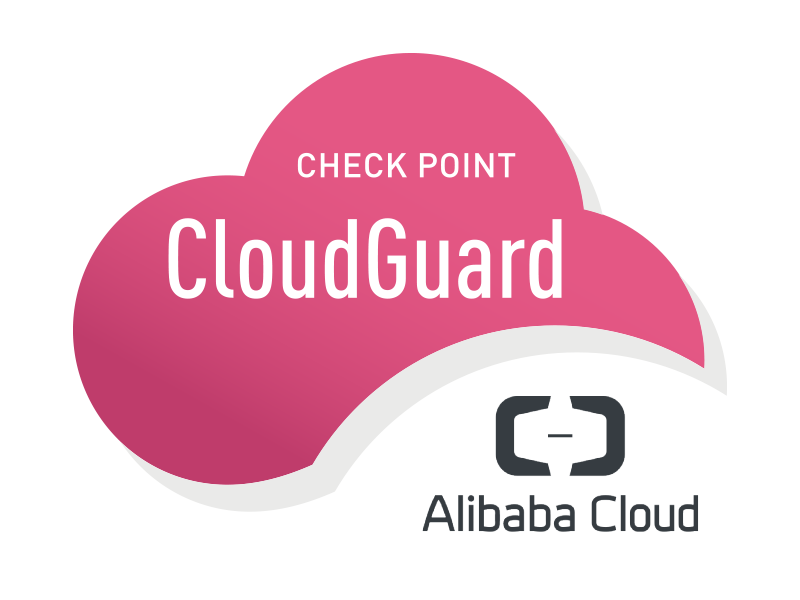 Check Point CloudGuard for Alibaba Cloud meets an organization's cloud security needs with flexible and manageable security options including; Firewall, VPN, Remote Access, IPS, Application Control, Antivirus, Anti-Bot, Threat Emulation and Threat Extraction. This License Agreement (the “Agreement”) is an agreement between you (both the individual installing the Product and any legal entity on whose behalf such individual is acting) (hereinafter “You” or “Your”) and Check Point Software Technologies Ltd. (hereinafter “Check Point”). “Affiliate” means any legal entity (i) directly or indirectly owning or controlling You; (ii) under the same direct or indirect ownership or control as You; or (iii) directly or indirectly controlled by You. Ownership or control shall exist through direct or indirect ownership of more than fifty percent (50%) of the nominal value of the issued equity share capital or of more than fifty percent (50%) of the voting rights. “Licensed Configuration” means to the extent applicable, as indicated on the License Key, the choice of features and the maximum number of users, devices or nodes (an internal computing device with an IP address) on the trusted side of the network or that is trying to traverse the firewall, and the numbers of cores, or the maximum throughput capacity stated, or the code generated from the master installation, or any other hardware or software specifications, as declared by You in Your purchase order, or request for License Key, and upon which the licensing fee was based. If the Product purchased by You does not come with a License Key then the Licensed Configuration shall be the minimum configuration allowed for the Product by Check Point upon which the licensing fee was based. “Licensed-server” means the server or appliance (defined by the host ID identified by You to Check Point when obtaining the License Key) which enables the Product to operate in accordance with the Licensed Configuration. “License Key” means the code provided to You by Check Point, which enables the Product to operate on the Licensed-server or appliance for the specified Licensed Configuration. “Product” means the object code copy of the software program, including Third Party Software, provided to You in association with this Agreement, together with the associated original electronic media and/or associated hardware devices (“Hardware Products”) and all accompanying manuals and other documentation, if available, and together with all enhancements, upgrades, and extensions thereto that may be provided by Check Point to You from time to time. “Managed Service Provider” means (a) You are in the regular business of managing the functionality of the Product for a fee, to entities that are not Your Affiliates (each a “Service Customer”); or if You are a company that provides such managed services to Standard Users that are a part of your corporation or of your Affiliates or (b) You indicated in Your purchase order or in requesting the License Key, that You intend to use the Products on behalf of Service Customers, and (c) You purchased the managed service provider package, if applicable. “Standard User” means You indicated in Your purchase order or in requesting the License Key that You intend to use the Products on Your own behalf, or You obtained the products from a Managed Service Provider, reseller, vendor or any other intermediate supplier. “Third Party Software” means any software programs provided by third parties contained in the Product. “Third Party Software Provider” means the third party that has the right to provide and grant licenses for the use of Third Party Software. 2.1 License. Subject to the terms and conditions of this Agreement, and payment of the applicable Product fees, Check Point hereby grants only to You, a non-exclusive, non-sublicensable, non-transferable perpetual license (with the exception of (i) the license shall not be perpetual if the Product is designated for a limited time period only, in which case the license shall terminate at the expiration of the applicable period; and (ii) with regards to any Hardware Product, the license shall be valid only as part of and for the life of the originally designated Hardware Product) to install and use the copy of the Product in accordance with the relevant end user documentation provided by Check Point only on the Licensed-server and only for the Licensed Configuration. You have no right to receive, use or examine any source code or design documentation relating to the Product. 2.5 Specific Restrictions. The Product is licensed to You based on the applicable Licensed Configuration purchased, as set forth in the Licensed Configuration definition in Section 1. The License permits the use of the Product only in accordance with the Product specifications as declared by You in Your purchase order, or request for License Key, and upon which the licensing fee was based. It is a violation of this License Agreement to create, set-up or design any hardware, software or system which alters the number of readable IP addresses, users, number of cores or exceeds the maximum throughput capacity presented to the Product with the intent, or resulting effect, of circumventing the Licensed Configuration. 2.9 Check Point Media Encryption Blade, DLP-1 Product Family and Check Point Capsule Docs Product Family. If you are using any of these products, in many countries you may be required to advise users that their data, actions taken on the data, and web traffic may be inspected. Please consult the Check Point user guide and local laws as applicable. Agreement. Any purchase of upgrades shall be subject to this Agreement, unless otherwise indicated by Check Point. 7.1 Limited Software Warranty. Check Point warrants to You that the encoding of the software program on the media on which the Product is furnished will be free from defects in material and workmanship, and that the Product shall substantially conform to its user manual, as it exists at the date of delivery, for a period of ninety (90) days. Check Point's entire liability and Your exclusive remedy under this warranty shall be, at Check Point's option, either: (i) return of the price paid to Check Point for the Product, resulting in the termination of this Agreement, or (ii) repair or replacement of the Product or media that does not meet this limited warranty. EXCEPT FOR THE LIMITED WARRANTIES SET FORTH IN THIS SECTION 7.1, THE PRODUCT AND ANY SERVICES ARE PROVIDED “AS IS” WITHOUT WARRANTY OF ANY KIND, EITHER EXPRESSED OR IMPLIED. CHECK POINT DOES NOT WARRANT THAT THE PRODUCT WILL MEET YOUR REQUIREMENTS OR THAT ITS OPERATION WILL BE UNINTERRUPTED OR ERROR FREE. CHECK POINT DISCLAIMS ANY WARRANTIES OF MERCHANTABILITY, FITNESS FOR A PARTICULAR PURPOSE, AND NON-INFRINGEMENT. Some jurisdictions do not allow the exclusion of implied warranties or limitations on how long an implied warranty may last, so the above limitations may not apply to You. This warranty gives You specific legal rights. You may have other rights that vary from state to state. reasonably beyond the control of Check Point. Certain features of the Product may not be forward-compatible with future versions of the Product and use of such features with future versions of the Product may require purchase of the applicable future version of the Product. EXCEPT FOR BODILY INJURY OF A PERSON, IN NO EVENT WILL CHECK POINT BE LIABLE TO YOU OR ANY THIRD PARTY FOR ANY DAMAGES ARISING OUT OF THE SUBJECT MATTER OF THIS AGREEMENT, THE PRODUCT OR ANY SERVICES UNDER ANY CONTRACT, NEGLIGENCE, STRICT LIABILITY OR OTHER THEORY, FOR ANY INDIRECT, SPECIAL, INCIDENTAL, OR CONSEQUENTIAL DAMAGES (INCLUDING LOST PROFITS), OR FOR LOSS OF OR CORRUPTION OF DATA, OR FOR COST OF PROCUREMENT OF SUBSTITUTE GOODS OR TECHNOLOGY, IRRESPECTIVE OF WHETHER CHECK POINT HAS BEEN ADVISED OF THE POSSIBILITY OF SUCH DAMAGES. CHECK POINT'S MAXIMUM LIABILITY FOR DAMAGES SHALL BE LIMITED TO THE LICENSE FEES RECEIVED BY CHECK POINT UNDER THIS LICENSE FOR THE PARTICULAR PRODUCT(S) WHICH CAUSED THE DAMAGES. Some jurisdictions do not allow the exclusion or limitation of incidental or consequential damages, so the above limitation or exclusion may not apply to You. 8.1 License Grant. With respect to any pre-release version of a Check Point product, including a Beta or an Early Availability product (all collectively referred to herein as a “Beta Product”) that may be provided to You by Check Point from time to time, at its sole discretion, Check Point grants You a non-transferable and non-exclusive license to use the Beta Product for evaluation purposes only. The license is designed to provide You with early operational experience with the Beta Product and to provide Check Point with specified information regarding Your experiences with the installation and operation of the Beta Product. The license shall be in effect for a limited period as determined by Check Point and certain other restrictions may apply. You may be asked to sign a separate agreement pertaining to the Beta Product. 8.2 No Obligations. Check Point has no obligation to provide support, maintenance, upgrades, modifications, or new releases for a Beta Product. Owing to the experimental nature of the Beta Product, You are advised not to rely exclusively on the Beta Product for any reason. NOTWITHSTANDING THE AFOREMENTIONED IN THIS AGREEMENT, YOU AGREE THAT THE BETA PRODUCT AND RELATED DOCUMENTATION ARE BEING DELIVERED “AS IS” WITHOUT WARRANTIES OF ANY KIND, INCLUDING WITHOUT LIMITATION ANY IMPLIED WARRANTY OF MERCHANTABILITY OR FITNESS FOR A PARTICULAR PURPOSE. IN NO EVENT WILL CHECK POINT BE LIABLE TO YOU OR ANY OTHER PERSON FOR DAMAGES, DIRECT OR INDIRECT, OF ANY NATURE OR EXPENSES INCURRED BY YOU IN CONNECTION WITH THE BETA TESTING. YOUR SOLE AND EXCLUSIVE REMEDY SHALL BE TO TERMINATE THE BETA TEST AND THIS LICENSE BY WRITTEN NOTICE TO CHECK POINT. the United States, including the Export Administration Act of 1979, as amended, any successor legislation, and the Export Administration Regulations (“EAR”) issued by the Department of Commerce, International Trade Administration, and Bureau of Export Administration. You warrant that You will comply in all respects with the export and reexport restrictions applicable to the Product and will otherwise comply with the EAR or other United States laws and regulations in effect from time to time. 10.2 Third Party Software. Certain Third Party Software may be provided with the Product for use in connection with the Product subject to the licenses of their respective proprietors. The provisions of this Agreement shall apply to all Third Party Software Providers and to Third Party Software as if they were Check Point and the Product, respectively, unless they are specifically listed and addressed at http://www.checkpoint.com/corporate/3rd-party-copyright/index.html, in which case, such Third Party Software Provider’s licenses terms will apply with respect to those specific Third Party Software products. 10.3 Government Restricted Rights. This provision applies to Products acquired directly or indirectly by or on behalf of any Government. The Product is a commercial product, licensed on the open market at market prices. Any use modification, reproduction, release, performance, display, or disclosure of the Product by any Government shall be governed solely by the terms of this Agreement and shall be prohibited except to the extent expressly permitted by the terms of this Agreement, and no license to the Product is granted to any government requiring different terms. The warranties provided by Check Point in this Limited Hardware Warranty apply only to Hardware Products you purchase for your use, and not for resale. The term “Hardware Product” means a computing device with a specific function and limited configuration ability. The Hardware Product is sold by Check Point for the purpose of executing the specific Check Point Software supplied with it. NOTHING IN THIS STATEMENT OF LIMITED WARRANTY AFFECTS ANY STATUTORY RIGHTS OF CONSUMERS THAT CANNOT BE WAIVED OR LIMITED BY CONTRACT. the date of activation of the Hardware Product. If the Hardware Product has not been activated, the warranty will be valid for fifteen (15) months from the date of Check Point’s shipment of the Hardware Product (“Warranty Period”). After the Warranty Period, certain return material authorization (“RMA”) services, as provided by Check Point (which are not covered under this warranty), are available for all Hardware Products pursuant to a purchased and active Check Point support agreement. Your sole and exclusive remedy, and Check Point’s sole and exclusive liability for defective hardware components, shall be that Check Point, subject to the terms and conditions of this Section 1, and solely upon confirmation of a defect or failure of a hardware component to perform as warranted, shall at its sole option, either repair or replace the nonconforming hardware component or return of the price paid for the Hardware Product. All replacement parts furnished to you under this warranty shall be refurbished and equivalent to new, and shall be warranted as new for the remainder of the original warranty period. If a hardware failure occurs in the first 30 days from the product’s software activation, Check Point will replace it with new part or full unit as may be needed. All defective parts, which have been replaced, shall become the property of Check Point. All defective parts that have been repaired shall remain Your property. This warranty gives You specific legal rights. You may have other rights that vary from state to state. The foregoing warranties and remedies shall be void as to any Hardware Products damaged or rendered unserviceable by one or more of the following: (1) improper or inadequate maintenance by anyone other than Check Point or Check Point’s authorized agents, (2) software or interfacing supplied by anyone other than Check Point, (3) modifications, alterations or additions to the Hardware Products by personnel not certified by Check Point or Check Point’s authorized agents to perform such acts, or other unauthorized repair, installation or opening or other causes beyond Check Point's control, (4) unreasonable refusal to agree with engineering change notice programs, (5) negligence by any person other than Check Point or Check Point's authorized agents, (6) misuse, abuse, accident, electrical irregularity, theft, vandalism, fire, water or other peril, (7) damage caused by containment and/or operation outside the environmental specifications for the Hardware Products, (8) alteration or connection of the Hardware Products to other systems, equipment or devices (other than those specifically approved by Check Point) without the prior approval of Check Point, or (9) any use that is inconsistent with the user manual supplied with the Hardware Product. The warranty period is not extended if Check Point repairs or replaces a warranted product or any parts. Check Point may change the availability of limited hardware warranties, at its discretion, but any changes will not be retroactive. If a Hardware Product or one of its component parts does not function as warranted during the warranty period, and such nonconformance can be verified by Check Point, Check Point, at its election, will provide either return and replacement service or replacement with a refurbished part/unit for the Hardware Product under the type of warranty service Check Point designates for that Hardware Product. A defective Hardware Product or one of its component parts may only be returned to Check Point upon Check Point’s prior written approval. Any such approval shall reference an RMA number issued by an authorized Check Point service representative. To request an RMA number, you or your local Check Point Certified Solution Provider (“CCSP/CSP/ACSP”) must contact Check Point’s Technical Assistance Center (“TAC”) and open a Service Request. You should always register the Hardware Product in your Check Point User Center account. If you do not register the Hardware Product with Check Point, you may be required to present proof of purchase as evidence of your entitlement to warranty service. The Hardware Product’s identification number will be required for all RMA cases. allegedly defective item is not covered by the terms and conditions of the warranty or that a warranty claim is made after the warranty period, the cost of the repair by Check Point, including all shipping expenses, shall be reimbursed by You. Check Point will attempt to diagnose and resolve your problem over the phone or web. Upon determination of the hardware issue is related to a malfunction of one of the Hardware Product components, an RMA process will be initiated by Check Point’s TAC. Check Point’s TAC will either issue a replacement of the faulty part (like Power Supply, Fan, Hard Disk, etc.) or a full Unit Replacement. For Warranty Replacement service, it is required that you deliver the faulty unit to a location Check Point designates, and provide courier name and tracking number to Check Point’s TAC. After the Faulty unit is returned to Check Point, Check Point will use commercially reasonable efforts to ship the replacement hardware within seven (7) business days. Actual delivery times may vary depending on Your location. Check Point’s TAC will send the required hardware to the Hardware Product’s physical location, as it appears in your User Center and as verified with You when opening the Support Service Request. For Hardware Advanced Replacement, support options Standard, Standard Onsite, Premium, and Premium Onsite are available for customers who have purchased the Hardware Product support plan with Check Point. More information on the Check Point support programs is specified on Check Point’s website. If a defective Hardware Product covered under warranty fails to operate within thirty (30) days from its activation, but no more than one hundred and twenty (120) days from the date of Check Point’s shipment of the Hardware Product, Check Point will provide expedited replacement of a new unit within two (2) business days from Check Point fulfillment hub, following confirmation of any such failure. Customers outside of the fulfillment hub region should allow for additional transit time due to international customs clearance. 6.1. Before Check Point or its partner exchanges a Hardware Product or part, to remove all features, parts, options, alterations, data and attachments not under warranty service and ensure that the Hardware Product is free of any legal obligations or restrictions that prevent its exchange. 6.2. To obtain authorization from the owner to have Check Point or its partner service a Hardware Product that you do not own. c. Inform Check Point or its partner of changes in the Hardware Product physical location. 6.4. To provide Check Point or its partner with sufficient and safe access to your facilities to permit Check Point to fulfill its obligations. 6.5. To ship back the faulty Hardware Product (or replaceable unit) suitably packaged according to the guidelines as Check Point specified in the letter shipped with the RMA, to the Check Point designated location. 6.6. You shall ship the faulty Hardware Product once TAC approves the RMA and provide the courier name and tracking number to TAC before Check Point processes the RMA. business days of the arrival of the RMA, or pay the standard Check Point list price of replacement Hardware Product. 6.8. To securely erase from any Hardware Product you return to Check Point for any reason all programs and data not provided by Check Point with the Hardware Product. You acknowledge that in order to perform its responsibilities under this Limited Hardware Warranty, Check Point may ship all or part of the Hardware Product or its software to third party locations around the world, and you authorize Check Point to do so. NOTWITHSTANDING ANYTHING ELSE IN THIS AGREEMENT OR OTHERWISE, NEITHER CHECK POINT NOR ITS SUPPLIERS WILL BE LIABLE WITH RESPECT TO ANY SUBJECT MATTER OF THIS AGREEMENT UNDER ANY CONTRACT, NEGLIGENCE, STRICT LIABILITY, OR OTHER LEGAL OR EQUITABLE THEORY, REGARDLESS OF WHETHER CHECK POINT OR ITS SUPPLIERS WERE ADVISED OF THE POSSIBILITY OF SUCH DAMAGES, FOR: (i) ANY PUNITIVE, INCIDENTAL OR CONSEQUENTIAL DAMAGES OR LOST DATA OR LOST PROFITS; OR (ii) FOR COSTS OF PROCUREMENT OF SUBSTITUTE GOODS, TECHNOLOGY OR SERVICES; OR (iii) FOR ANY CLAIMS BASED ON ANY ERROR, DEFECT OR NONCONFORMITY IN THE PRODUCTS OR SERVICE, FOR ANY AMOUNT IN EXCESS OF THE PRICE PAID TO CHECK POINT FOR SUCH DEFECTIVE PRODUCT(S) OR SERVICE; OR (IV) FOR ALL OTHER CLAIMS NOT RELATED TO AN ERROR, DEFECT OR NONCONFORMITY IN THE HARDWARE PRODUCTS, ANY AMOUNTS IN EXCESS IN THE AGGREGATE OF THE AMOUNT PAID TO CHECK POINT HEREUNDER DURING THE THREE (3) MONTHS PRECEDING THE DATE THE CAUSE OF ACTION AROSE. 8.1 In the course of receiving Limited Hardware Warranty services, You agree that you will not ship, transfer, or export the Hardware Product into any country, or make available or use the Hardware Product in any manner, prohibited by law. 8.2 The Hardware Product is subject to export control laws of the United States of America and/or other countries and/or may be subject to additional export control laws applicable to You or in your jurisdiction. 8.3 You understand and acknowledge that upon entry of the Hardware Product into the United States, it becomes subject to regulation by agencies of the U.S. government, including the U.S. Department of Commerce, which prohibit export or diversion of certain products and technology to certain countries. Any and all of Your obligations with respect to the Hardware Product shall be subject in all respects to such United States laws and regulations as shall from time to time govern the license and delivery of technology and products abroad by persons subject to the jurisdiction of the United States, including the Export Administration Act of 1979, as amended, any successor legislation, and the Export Administration Regulations (“EAR”) issued by the Department of Commerce, International Trade Administration, and Bureau of Export Administration. You warrant that You will comply in all respects with the export and reexport restrictions applicable to the Hardware Product and will otherwise comply with the EAR or other United States laws and regulations in effect from time to time. 8.4 You warrant and agree that You are not: (i) located in, under the control of, or a national or resident of Cuba, North Korea, Iran, Syria, Lebanon or Sudan, or (ii) on the U.S Treasury Department list of Specially Designated Nationals or the U.S. Commerce Department’s Table of Deny Orders. THESE WARRANTIES GIVE YOU SPECIFIC LEGAL RIGHTS AND YOU MAY ALSO HAVE OTHER RIGHTS WHICH VARY FROM STATE TO STATE OR JURISDICTION TO JURISDICTION. WARRANTIES OF NONINFRINGEMENT. CHECK POINT DOES NOT WARRANT THAT THE CHECK POINT HARDWARE PRODUCT(S) WILL MEET ANY REQUIREMENTS OR THAT THE OPERATION OF CHECK POINT HARDWARE PRODUCTS WILL BE UNINTERRUPTED OR ERROR FREE. You may contact Check Point technical support by web request at: URL:https://usercenter.checkpoint.com. For the United States, Canada, Latin America, European Union and Asia Pacific countries, to reach Check Point by phone, please refer to the technical support phone numbers listed at the above Check Point website for the number covering your region.